Visitors to the Library at the University of Bradford will often come across references to “Commonweal” and maybe wonder what this means. Wonder no more! Commonweal means “the good of all”. The Commonweal Library is an independent peace library run by Trustees and volunteers. Commonweal is located within the main Library of the University of Bradford (handily just outside my office on Floor 1!) and is a treasure trove of books, journals and pamphlets on protest, social change, religions, ideas, and much much more. Its extraordinary collections of campaign archives are part of Special Collections. “Befriending Commonweal Peace Library“, a feature in the most recent issue of Peace News, is a great introduction to Commonweal’s fascinating story. The author of the feature, Michael Randle, encourages activists and academics interested in nonviolent protest to make use of Commonweal’s wonderful resources. 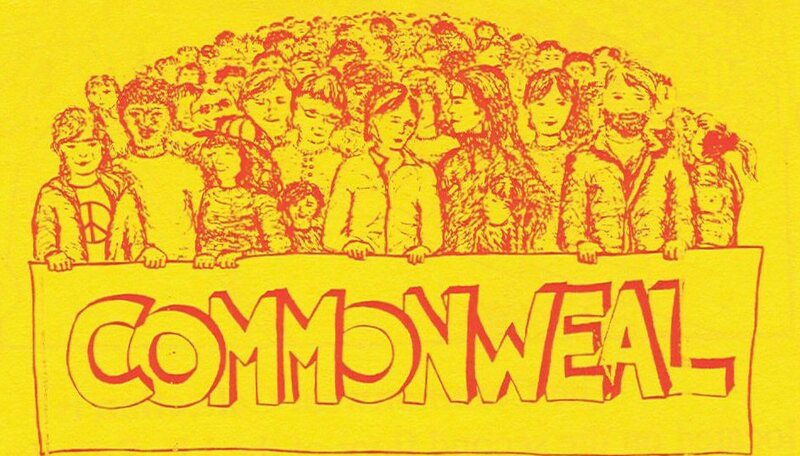 Commonweal, like Special Collections, is for everyone. Unlike Special Collections, however, Commonweal is open access: you don’t need an appointment and you can explore the shelves to your heart’s content. Commonweal’s website, including information about how to join. Commonweal Archives and other peace-related Special Collections. Special Collections staff and many of our University of Bradford and Commonweal colleagues past and present have been involved in creating a new encyclopaedia surveying the historical, political, theoretical, and philosophical issues relating to peace and conflict. To be published later in 2009 by Oxford University Press, the Oxford International Encyclopedia of Peace will be available in 4 volumes and also online. Contributors from the University include Peace Studies staff members Peter van den Dungen, Tom Gallagher, Paul Rogers, Tom Woodhouse, John Allcock and Antonia Young. Alison Cullingford of Special Collections and Caro Noake the Peace Studies Librarian have also written sections. A new colleague will soon be joining the Special Collections team. We are delighted to have appointed Helen Roberts as PaxCat Project Archivist, to start on 11 May 2009. More about Helen and PaxCat on the PaxCat Blog. Bradford was declared a “City of Peace” by resolution of the Council on 13 Oct 1997. The initiative Bradford: City for Peace aims to make this real. It has created a Peace Trail, a walk around Bradford linking sites relating to the city’s rich history of peace work. Now, if you have a smartphone, you can download an interactive version of the Peace Trail. See the Bradford: City for Peace website for details. Posted in Bradford, Peace, Priestley, J.B. Some great news! The PaxCat Project to catalogue the Commonweal peace archives is to receive funding from the National Cataloguing Grants Scheme. Find out more on the PaxCat Blog.